look before you click! | whats a cookie? « so, what IS a cookie? As we all know by now, email is a favorite medium for less-than-honest individuals to wreak havoc on unsuspecting prey. These troublemakers are much more clever than you’d guess, but luckily we reputable internet users have the ultimate leverage (besides expensive anti-virus this and that)…careful clicking!! In order to really do any damage, nearly every virus or spyware requires YOU to initiate the infection. Virus trouble can start by clicking on a link in an email, filling out a form, or clicking a particularly enticing popup. This means that careful clicking habits are your #1 shield against online problems. Luckily, most obvious spam is caught by your email provider before it ever gets to your inbox (Hotmail, Gmail, Yahoo, etc). But keep in mind, when they put a message in your junk mail folder, chances are it’s for a very good reason. Even though you think you kind of remember that you had a Uncle Randy that just may be trying to get in touch with you about a secret vast inheritance, email providers use reliable statistics for their decisions when deciding if it is from a human or not…and when you think about it when’s the last time you had to send out a message to your closest 17 million friends in one afternoon?.. So, in an effort to prepare you for battle (and to minimize the number of “I got a virus, how soon can you get here” calls to your IT guy) here is the easiest way to avoid a disaster. Take this unsuspecting link for example..
Hmm…it says “click here for free money” in the name, that sounds good. Everybody likes free money. Especially me (well first of all, the fact that it says “click here for free money” should be your first clue that it’s up to no good. If you were seriously fooled then I’m not sure if any advice I have can be of assistance to you). Beyond the enticing title, try hovering your mouse over the link without moving it for a few seconds. When you do a quick mouse hover, before you click, your computer will tell you where that link actually goes. 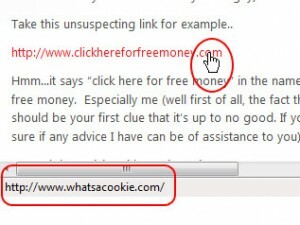 In this case, I made a link that even though it looks like “clickhereforfreemoney.com” it actually takes you to whatsacookie.com. Luckily for you, I’m nice enough to not send you to a really unfortunate website just to teach you a lesson. So look before you click, because once you get to one of these sites it can be even more dangerous, especially if the perpetrator is very sneaky…these guys sometimes create duplicates of reputable sites just to confuse you into putting your password in – that means keep an eye out for twiitter.com or focebook.com links! Side note…this works in any common internet browser (Internet Explorer, Firefox, Chrome, or Safari). If you look at the bottom of the window when hovering over a link, it will inform you as to the target of the link that you are considering clicking on. *lots of simple viruses proliferate by abusing someone’s contact list – often without their knowledge. This means that you could very well get an email from your mom or dad that looks harmless, but it was sent automatically because they got a virus of some sort. So the rules of attachments and links should apply, even if you trust the sender of the message (as opposed to asdidfnwe8237ksnd@abc123.com – which should raise some red flags). Make sure to check any links before clicking to make sure they are going to the right place, and keep your wits about you…if your dad has never before sent you a link to see some pictures from last weekend, what are the chances he would do it with no warning and virtually no explanation? This entry was posted on November 29, 2009 at 4:27 pm, and is filed under how to's. Follow any responses to this post through RSS 2.0. Both comments and pings are currently closed.